Cherie Enns (third from left) with Provost Eric Davis, President Joanne MacLean, and AVP Teaching and Learning Maureen Wideman. For more than three decades, Cherie Enns has worked as a passionate urban planner dedicated to local and international policy, human rights and community design. She’s helped dozens of students effect change — in their own backyards and throughout buzzing Africa cities, with countless others coming to appreciate their impact on the world around them. Thanks to this and more, she’s the recipient of this year’s Teaching Excellence award at the University of the Fraser Valley. 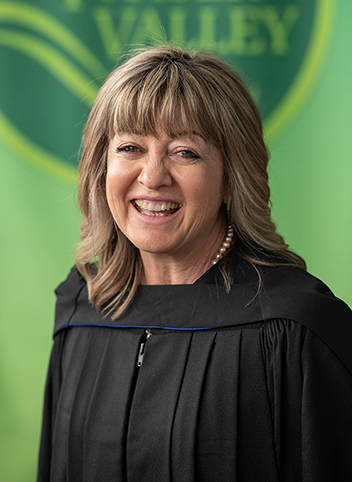 An associate professor in UFV’s Geography and the Environment department with a focus on global sustainable development, Enns is widely considered at the forefront of pedagogical innovation and leadership. “Professor Enns is at the heart of this nexus that brings together students, faculty, and community,” says former student Jeremy Wagner. 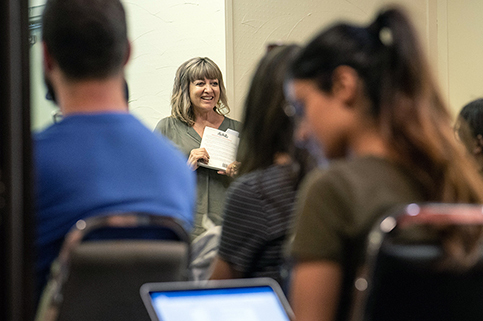 Enns leverages diverse networks to the benefit of students, building bridges between classrooms and communities to provide transformative learning, networking, and knowledge opportunities for faculty, staff, and students alike. Enns has taught at UFV for more than 30 years. She makes her mark by helping others find ways of leaving less of a footprint on the earth. Over the past 10 years, she successfully applied for and managed $600,000 of University Canada funding for placements of students in multiple practicum positions. In Africa, she slotted students into half a dozen countries, including Kenya and Tanzania. Throughout the Enns-led Queen Elizabeth Scholars (QES) program’s three-year cycle at UFV, eight Africans have conducted research here, with 30 UFV students travelling to Africa as interns and over 15 scholars coming to from East Africa to UFV. 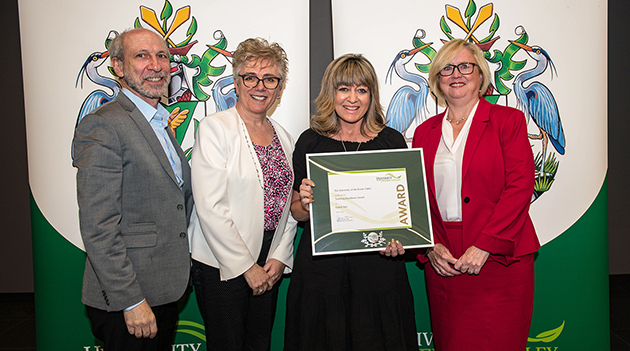 She recently helped acquire another round of funding, meaning an additional 38 UFV and international students can immerse themselves in the QES experience, which was recently expanded to include India. While advancing sustainable international food security and sustainable urban systems in Africa and beyond is certainly a passion, Enns is also focused on striking a balance here in the Fraser Valley – most recently leading a tactical urbanism pop-up Rail District Community Food market in downtown Abbotsford June 14. “Working with Valley Food and Farm Collective and Field House, the students looking at low-cost temporary community interventions with a goal to foster and strengthen the community while affecting long term systemic change,” she explains. A valued expert when called upon by journalists for a wide range of topics, Enns’ commitment to sustainable urban development stretches to include projects in refugee settlements within Easter African as well as an important role in the development of Abbotsford’s U-District planning, and serving as coordinator for the Abbotsford City Council Task Force on Homelessness. All on top of a rigorous teaching schedule. “Lots of times, especially around this time of year, you wonder if maybe at this stage I should focus on other aspects of my professional life, but in all honesty, I really love being with all these 20-somethings,” she says.